3 December 2012: This was a day of work, and the plumbing in the loft is nearly complete for both the Sunboxes. 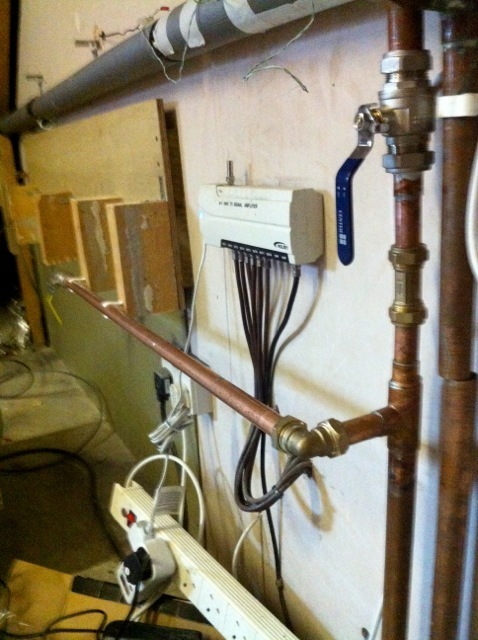 Insulation, expansion tank and control systems are now needed. 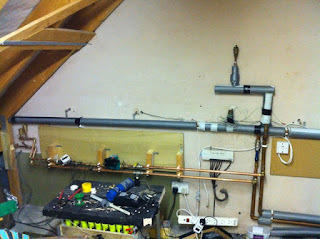 The first part of the Return pipe is in size and it has a valve at the end so this part will be water tight. The cut pipe on the right is waiting to have a new Tee piece inserted. Work continued in the loft to get the Flow pipe installed, and this is also sealed with a lever ball valve. 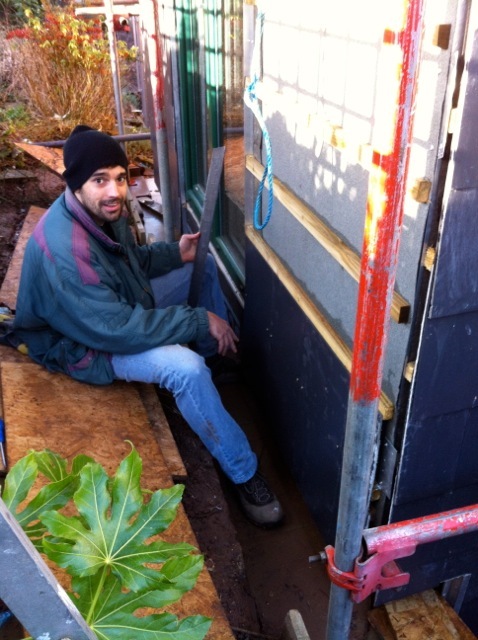 Therefore we were able to refill the system with coolant and get the Sunbox working again, to take advantage of some nice winter sunshine during the afternoon. Now the additional pipes are added (beyond the lever ball valve) for the Flow and Return. The target is those pipes at the far end with the airlock removers. The pipes in the foreground are sloping downwards (at about 1:100) to allow air to rise along the pipe. At the mid point, there is a slight bend upwards towards the airlock remover in the far distance. The final 15mm connections are made, ensuring always that there is a natural route back to the airlock preventer. The indoor work is completed. 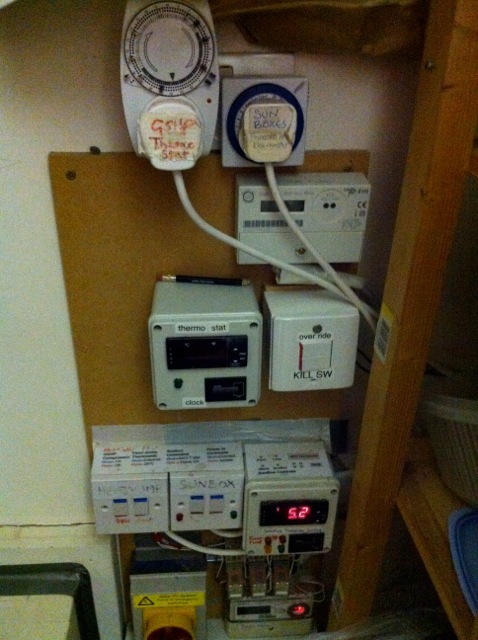 Down below, in the Utility room, I am making a start on the control system. I am using an identical controller to the AKA used in the first Sunbox, but I still have plenty of remembering to do to wire it in. More cable needs to be threaded through the house from the Utility to the furthest end of the loft, and down to the new Sunbox. Douglas came round to help get more slating done, and the amount in this photo was done by morning coffee - 2 weeks ago, this much took almost a day. By lunchtime, Douglas had used up all the battens and done most of that wall. 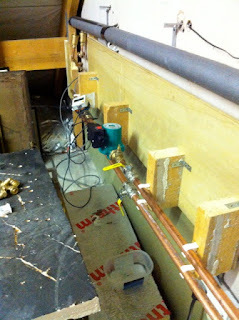 A view of the new plumbing arrangement, well fixed to the wall on a plywood backing, giving options for fixing clips at the optimum locations. 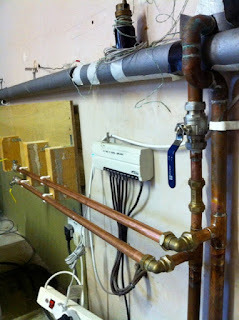 Next task is to do the plumbing for the radiators in the actual Sunbox. I need some daylight for that! 10 Dec 2012 Postscript: I have bought an 8 litre expansion tank as I have realised that there is a chance that the Surya-4 loop could be closed off with the yellow valves but could be subject to thermal expansion if the sun shines. Each part of the loop must be able to expand safely. 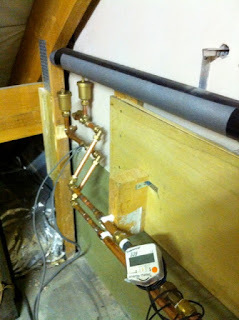 This is something I did not understand in the early days which is why I had a leak in the Sunbox circuit in March 2012. 16 Dec 2012 Postscript: Down in the Utility room, the AKA Thermo-controller is now wired in, along the the double-2-way light switch that provides the Override and Kill functions. Solar energy is been seen as the future power source which will lighten up our new world. Quite an interesting post, waiting eagerly for the next update. Thanks. Hi, and thanks. I have just realised that it is not complete. When both the yellow valves are closed, as they might be sometimes, the liquid in that part of the loop could still swell and leak. I have bought an 8 litre expansion tank and will fit that before the system has been up for long. Currently, I am doing the electrical control wiring for the pump and controller.